SHINee, f(x), EXO & Red Velvet all appear in a new CFs for Baskin Robbins. The two CFs are approximately 20-seconds long and set in a water park. The groups are seen to enjoy a variety of Basking Robbins products, ranging from ice cream cakes & shaved ice platters to refreshing fruity smoothies and iced coffees. 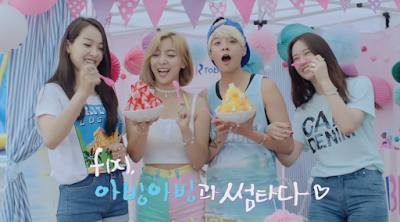 All of the groups have previously appeared in CFs for Baskin Robbins. You can watch the two commercial films below.